Tamashii Nations‘ line of high-end prop replicas continues with the official announcement of Tamashii Lab Zaruba from GARO! 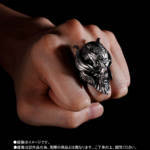 The Golden Knight’s faithful Madou ring can not only be worn as a normal ring, but also includes a special pedestal which when connected will activate the ring’s light up eyes and sound clips. Not only that, but Zaruba also has an interactive feature and will respond when spoken to! Also included in the box is a special book about the item as well as a postcard with a message from series creator Keita Amemiya! Tamashii Lab Zaruba is a Premium Bandai exclusive item due for release in November, with a price of 9900 yen. Check out the video below for a better look at the item’s features, as well as the official images after the jump! Premium Bandai’s just launched the product page for the Tamashii Lab Zyusouken and with it we have some new details for this release. The Tamashii Lab Zyusouken measures about 46.5 cm long with both PVC and Diecast used in it’s construction material. Unlike the Legacy Dragon Dagger, this release includes is a unique stand designed specifically for this release, a booklet, and some sort of special message card. Of course, the Zyusouken will feature sounds from the show along with playing Burai’s theme song though whether or not any of these sounds differ from the Legacy Dragon Dagger wasn’t specified. Tamashii Lab Zyusouken will be released May 2017 with a price tag of 13,500 yen before middleman fees and overseas shipping. 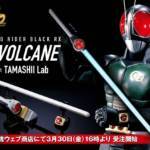 Even though this special release was literally just revealed today at Tamashii Nations 2016 we’ve already received confirmed release information for it! Thanks to a listing on Amazon.JP we have confirmed details for the Tamashii Lab Laser Blade Origin Version! This bundle gets you this new unique version of the Laser Blade, new more ornamental display bases that differ from the original release, and the DVD/Blu-Rays of the Space Squad film and the Girls In Trouble Special! This is absolutely something of a must have for die-hard Metal Hero collectors. It was nice knowing you all, I’m off to be homeless and clutch this thing in an alleyway somewhere. Tamashii Lab Gavan’s Laser Blade Official Images & Promotional Video with Kenji Ohba! This expensive collector piece was revealed only yesterday, but now we have our first official look at the Tamashii Lab Laser Blade from Space Sheriff Gavan! As reported previously this impressive item features an IR sensor that lets the Laser Blade detect your hand as you slide ir up the blade to “charge” it in the same way that Gavan does for his Gavan Dynamic attack. Whilst doing so you can press a button on the hilt to the either the series BGM, or rapidly press it to recreate sound effects from the show. 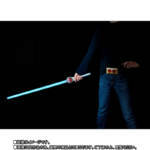 These images also confirm the inclusion of the fantastic set of display hands to hold the Laser blade. See the promo video below with the legendary actor who played Gavan, Mr. Kenji Ohba, demonstrating these wonderful features. The Tamashii Lab Laser Blade is set for January 2017 release for a whopping 16,200 yen. 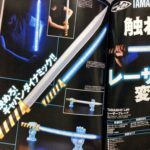 Space Sheriff Gavan: Tamashii Lab Laser Blade Revealed! Legacy Collection what? It looks like Tamashii Nations is getting in on premium 1:1 scale replicas for a whole new subset of fans, specifically Metal Heroes. 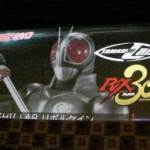 We’ve just gotten our first look at the upcoming Tamashii Lab Laser Blade! A lifesize replica of Space Sheriff Gavan’s signature weapon. 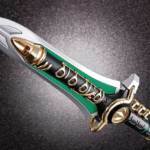 This surprising piece looks to be one of the most complex replica weapons Bandai has produced to date. Featuring an IR sensor, the Laser Blade allows you to slide your hand up the blade to “charge” it in the same way that Gavan does for his Gavan Dynamic attack. Whilst doing so the Blade lights up in sequence and plays the appropriate sound effects while also playing the series’ BGM! The Tamashii Lab Laser Blade is set for January 2017 release for a whopping 16,200 yen. 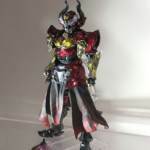 Currently it’s believed to be a Premium Bandai exclusive releases but we don’t have confirmation on that as of yet.